The Tribute is designed to satisfy the customer who loves the style of our Heritage woodstove but doesn’t need as much heat. 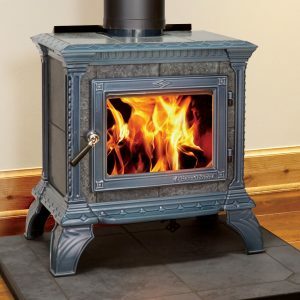 For a warm welcome, and taking the chill off your large room, or smaller home, the Tribute freestanding wood stove does it with style and efficiency. When fully loaded, the new Tribute will burn for up to 7 hours. The Tribute has a 1.2 cubic foot firebox and is rated at 36,000 BTUs. Using the full 1¼” thick soapstone, it has a HeatLife (TM) rating of 9 hours. In addition, the Tribute warms your home with minimal fire tending required.